The Asus Eee PC 1015PN-PU27 belongs to a new breed of netbooks that run on dual core processors and come with faster DDR3 memory modules. The 1015PN is powered by an Intel Atom N570 dual core processor and it comes bundled with 1GB of RAM. It has one SODIMM slot that supports up to 2GB. This netbook comes with a 10.1-inch LED backlit display that makes for good image quality for movies and images. It comes with NVIDIA’s ION graphic solution for the Atom series built in, making it quite a capable netbook that can handle high resolution movies and also some of the modern games at low resolutions. It also comes with the NVIDIA Optimus intelligent graphics switching technology for better battery life. Since the 1015PN is from the SeaShell series, it inherits the sleek design cues that have made the series popular. The netbook has a plain black matte finish along with a slim profile that makes it look quite good. The keyboard has Chiclet keys in a layout that utilizes every bit of space possible to make individual keys larger. The keys are shaped well and have a good travel, making for comfortable typing. The touchpad sits flush with the rest of the palm rest and has the same finish. It is demarcated by sliver strips on either side and sports a single bar click button. It supports multitouch and enables you to zoom in and out through gestures. The 10.1 display is LED backlit and quite bright under most average indoor scenarios. Coupled with the NVIDIA ION graphics, it makes for a good entertainment netbook with high-resolution movies and 3D Gaming support. The dual core Atom processor supports a good bit of multi-tasking. You can easily have a good multi-tab web surfing experience whilst playing music in the background and perhaps one more lightweight application open. The processing power is also good enough for you to do some photo editing and similar processor intensive work. Increasing the RAM will also help in getting more performance out of the processor and graphics chip. The Eee PC 1015PN-PU27 comes with 250GB of local storage and a complimentary 60-day trial of ASUS Web Storage cloud storage service with 500GB storage space. The battery life is rated at up to 9.5 hours, which in real life scenarios can come down to around 7-8 hours and hence makes for all day mobility if used judiciously. On the wireless front, it comes with Wireless-N WiFi support (802.11b/g/n) and Bluetooth 3.0 support. There’s also a 10/100 Ethernet port for LAN connections. There’s a 2-in-1 card reader with MMC and SD card support. There’s a VGA port, 3 USB 2.0 ports and the usual audio ports. It comes bundled with Windows 7 Starter Edition, which is usually the only complaint that consumers have about this netbook because of the OS’s limited functionality. However, most are able to find a way around it using tools found online. Other than that, consumers reported being quite happy with the netbook with special praise directed at the processing, graphics, battery life, keyboard and overall design. 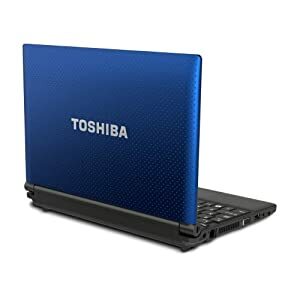 Toshiba’s NB505-N508BL is a 10inch netbook powered by an Intel Atom N455 1.66GHz processor with a 512KB L2 cache. It comes with 1GB DDR2 RAM, which can be expanded up to 4GB. This netbook is aimed at those who want to perform daily and basic computing tasks while on the move. The NB505 is a simple netbook with soft aesthetics and a small footprint that makes it easy to carry around. Most of the laptop features a smooth black finish with a blue rubbery coating at the back of the screen. The palm rest also features a black finish but the material is the same rubbery one as the coating on the back of the lid. The bottom has two pegs located right underneath the screen hinges where the battery is. This gives the netbook a slight incline towards the user when placed on a flat and level surface. This makes for comfortable typing when using it on top of a table or similar things. The 10.1-inch screen does not offer much screen and the 1024×600 native resolution suits it well. Any higher and the on screen elements would become to small to work with. It’s a LED backlit display, which makes for a good image quality when watching movies or viewing images. The 1.66GHz Atom N455 processor on the NB505 is just enough to handle your basic needs. You can easily surf the net, check your email, listen to music, edit documents, read eBooks and watch standard resolution movies. However, you can only do a few of these things at a time. Surfing and playing music is fine but too many tabs will slow the netbook down. A RAM upgrade will solve this issue to a certain extent though. The 250GB SATA 5400RPM HDD is enough to carry a lot of your music, movies, documents and other things around. The integrated Intel GMA graphics chip will not be able to handle HD movies but standard videos, including low resolution online streaming videos will play smoothly. Toshiba has thoughtfully added Wireless-N WiFi support along with support for backwards compatibility with b/g type wireless networks. There’s no Bluetooth on the NB505 but it can easily be remedied with a small USB Bluetooth dongle that are easily available online and at your local computer store. There are 3 USB ports and a VGA out port in case you want to make presentations. There’s an SD card reader and a 10/100 Ethernet port. The Toshiba NB505-N508BL netbook comes bundled with Windows 7 Starter Edition, which is point of complaint for most consumers. Most have either upgraded or found ways around the restrictions placed by the Starter Edition such as no support for different themes or backgrounds. 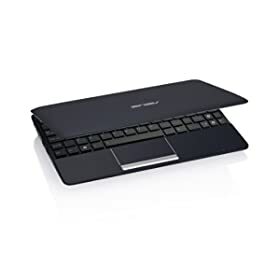 Customer reviews are mostly positive with praises for the Chiclet style keyboard with separate page-up and page-down keys and dedicated arrow keys. For most who desire a basic and small computer, this is a good option. Most users prefer to uninstall the bundled software from Toshiba although some find them useful. LG [NYSE:LPL] has just released a new netbook that goes by the name of X170. It is your normal netbook fare with an Intel Atom processor and average memory and storage. But it has a new feature that distinguishes it from all other netbooks in the market. This feature is what LG calls the “SmartPOP” feature. It allows you to access your phone from your netbook in ways that you wouldn’t expect. Asus, as I have often remarked, is the company that is solely responsible for starting the whole netbook trend. The form factor was already there but not very popular or wanted. Now it seems like the company is again on the verge of starting something new — including the latest tech in netbooks. Asus recently released the Eee PC 1015PEM that houses multiple cutting edge features. The 1015PEM has USB 3.0 ports, which are quite the rarity right now because of how new the standard is. It is usually available only in high-end laptops and portables. Besides, there are talks of it being rendered obsolete by Light Peak — something that jointly developed by Apple and Intel. It also has Bluetooth 3.0, which is again another first in the netbook category in all likelihood. There are hardly enough mobile devices out that have this standard. As can be deciphered from the version number, this is an upgrade on good ol’ Bluetooth for more speed and better connectivity. Rounding off the whole thing nicely is the latest Intel Atom processor powering the whole machine. This new chip is the first dual-core Atom that is meant for portables. The previous dual-cores were meant for low-power desktops and nettops. Although some netbook models did experiment with it, this new chip is the first one that has been designed to be used in a portable. The new chip fuses two cores on the same piece of silicon along with a GPU. This makes the overall communication faster by cutting out the bus communication paths between the CPUs and the GPU. The single die approach also ensures that there is no noticeable increase in power consumption even with the increased speed. Looks like Asus has quite the netbook on their hands right now. But this is just the initial stage before this becomes the standard configuration and that will happen fast. IFA as usual has a lot of interesting things to see and Samsung has brought out something at the trade show that interests us a lot. They have introduced the N350 netbook that has the capability to connect to both 3G+ HSPA networks and 4G LTE networks. Hence, theoretically it can achieve speeds of up to 100Mbps on the latest of networks but then it can also connect to fast 3G services and peak at 21 mbps. The netbook itself is quite modern and classy in design. It features the chiclet style keyboard that is commonly seen in Apple and other high-end netbooks. It is now filtering down to the lower-end of the market. It has a barrel style hinge that looks better than the normal hinge designs that we usually get to see. However, it is the same old thing when it comes to the configuration. It is sporting a 1.66GHz Atom as the processor. The memory is better thanks to the DDR3 support that the latest Atom has but it is still stuck at 1GB thanks to the Atom specifications that the manufacturers have to follow. AS for the connectivity outside the mobile broadband networks, there’s WiFi in the N350. There’s also a 1.3MP web cam, so you can utilize your ultra fast bandiwidth for some smooth video chatting. The N350 is on show at the IFA but it has no release date as of yet. Samsung has been specifically silent on that count but that is also because there aren’t that many 4G LTE networks in the world right now. That makes the netbook not all that practical to buy right now. As for the price, that is also unknown at this point but it is expected to be more than the normal thanks to the dual access mobile chips. Acer is not cutting its main netbook competitor any slack and is going to release its own dual-core Atom netbook soon. This development comes from newly leaked development details from deep inside Acer. The new model is going to be called D255 and it is going to go on a head to head collision course with Asus’ Eee PC 1215N. The Eee PC 1215N is a fairly new model from Asus and it is their first to sport the new dual-core Atom N550 chip. Atom of course, already had a dual-c0re chip before this — the N330. But that was not meant for use in portables, for power consumption issues of course. Intel has been hard at work developing a chip that will work well for netbooks and still be able to run twin cores simultaneously. The Atom N550 has two chips running at 1.5GHz each and thus gives the whole system a significant power boost. The difference will especially show in multi-tasking performance, which is a processor oriented job. However, other than the processor details, little else is known about this forthcoming Acer netbook model. It is believed that the D255 will actually resemble the D260 in terms of the other hardware features and looks. The D255 is expected to have different color options and perhaps a chrome trim. So nothing out of the ordinary is to be expected from this release. There’s one thing that might differentiate the two competing models from Acer and Asus respectively, quite distinct from each other. Whilst Asus’ model uses the NVIDIA ION 2 graphics to deliver superior graphics and 3D performance, Acer’s model might be paried with an ordinary Intel onboard graphics. But less graphics performance also means longer battery life and vice versa. So it might be a close one after all. We know now that the dual-core Atom is finally going to make its way to netbooks. The dual-core Atom chips that we have now are basically targeted at the desktop/nettop area. Even though we have a few portable models sporting them, they are not known for battery life efficiency. So now, Intel [NASDAQ:INTC] is going to release a new dual-core Atom that will bump up the processing speed of our beloved netbooks and still keep them running for a sizeable amount of time. But this joyous news was tainted some time back, when reports of Intel maintaining its restrictions over the netbook screen sizes surfaced. If it were to happen, manufacturers would not be able to use the new dual-core Atom chip in netbooks that had a screen size of more than 10 inches. But that claim was always conflicted because there were already talks of the Asus Eee PC 1215N getting this upgrade and that model has a 12 inch screen. Now, another claim is surfacing that states Intel will be pulling this restriction upon release of the said chip. This would finally enable manufacturers to make dual-core Atom netbooks that have screens sizes like 11 and 12 inches. We are of course not expecting to see 15 inch screens on Atom devices but 12 inch options are always nice to have. It seems like as Intel continues to innovate on the Atom front, it is beginning to lift some of the restrictions that have held manufacturers from getting more creative with their offerings. Intel’s restrictions have actually kept the netbook market in a sort of forced conformity that made a lot of the mainstream netbooks look very similar. Some are only distinguishable by their branding and built quality because the internals are the same. However, those things are about to change it seems and the predictions of the netbook really taking over this year might come true after all. Intel’s Developer Forum is now being held in Beijing and the company is seizing this opportunity to show off its latest attempt at entering the mobile and netbook computing industry in a bigger way — MeeGo. MeeGo is the result of a cross-pollination between Intel’s Moblin and Nokia’s Maemo 5. If you don’t remember this from this years MWC — both companies abandoned their respective nascent mobile OS projects in favor of this joint venture that they call MeeGo. MeeGo works on a cross platform QT framework that is commonly used for app development in Linux environments. Intel showed of it’s own iteration of MeeGo and it looked like the UI has remained much the same as it was on Moblin. So this makes us wonder if Nokia will also make their version have the same UI as Maemo and only share the framework that ties the two as one. But in that case, the apps that they share in common might look a bit out of place on one or both. Intel displayed multiple deployments of the MeeGo 1.0 – TV, netbook, mobile phone and kiosk. The demoes reportedly displayed the ability to sync up with each other and pull media files and play them back from the point where they were left off on the other device. Embedded above is the video of MeeGo running on a 1.6 GHz Intel Atom netbook. The UI uses tabs to separate major zones like real time social networking updates, applications, contacts, etc. The switching looks fast enough for a 1.6 GHz netbook but it remains to be seen how well it performs on less powerful devices under real life conditions. MeeGo will be tied to both Nokia’s Ovi Store and Intel’s AppUp store based on what kind of a device it is running on. Consumers can get their hands on MeeGo phones later this year with the latest N900 and LG GW990 running on it. MSI must be pretty chuffed with themselves for making the Wind line of netbooks. They are mostly known as a component manufacturer before they came out with the Wind to ride on the big netbook wave of the last two years. The Wind has been pretty successful and has sold millions. This has caused MSI to commemorate the success by releasing a new Wind model. It is called the Wind 135 and it has some real muscle for a change. Okay, so when I say muscle, do remember that I mean it in a netbook way. That means that it has something extra as opposed to just a new look. The U135 is powered by a chip from Intel’s new Pine Trail series Atom processors. There is a choice between 160GB and 250GB HDDs when it comes to storage, which is pretty nice to have on a netbook. Also, the keys are supposed to be 20% bigger and that can really make a difference in how good it feels when you are using it on a regular basis. Netbook keyboards have always had small keys to conform to the form factor, so we will take anything that is bigger than the average. So this is actually a worthwhile feature to talk about. The power consumption has also come down. It now consumes only 7 watts of power. With the optional 6-cell battery, you can really make your netbook last well beyond your entire working day. Other than these features, everything else is pretty much what you expect them to be. There is 1GB of DDR2 memory, the screen is 10″ and you get Windows 7 Starter Edition. There’s a 1.3MP webcam, 3 USB 2.0 ports and 4in1 card reader slot. That last one is actually another really useful feature. You can get it for around $310-$330 on Amazon. The HP 210 Netbook is officially available. It is available on retail and it is also available in troubleshooting entries. But there’s one major thing missing — the thing was never announce officially. No glitzy photosets, no long winded PR, none of that. May be HP is cutting costs while the global economy stabilizes out. You never know what they are up to but at least the device is here for us to buy. The HP 210 is a netbook device that turned up just a week or so back on troubleshooting pages where support pages fully list it’s specs. In the meantime, it was available for sale on the e-tailer eCost. On eCost, it was said to be in stock and going for $399 for the matte black option. I like that, the matte black option. Other than that little morsel, you also get to know that the thing is another netbook that belongs to the first wave of Pine Trail netbooks. Pine Trail is the next version of Intel’s Atom chip. The 210 is powered by an Intel Atom N450 (a Pine Trail indeed) and has integrated graphics. That means no HD video or any such thing. It will still be pretty sluggish at only 1GB RAM and storage is the usual (read boring) affair with 250GB coming in as standard. Battery is 6-cell but no estimates have been found. Is this beginning to get a norm with HP? Let’s hope not. I say this because a similar thing happened with the Mini 311. May be the marketing dept. is really small and forgetful at HP. Get your act together HP, everybody’s watching.